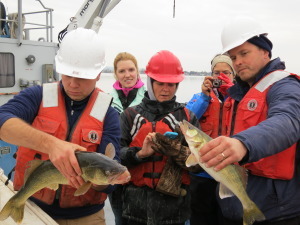 Twenty intrepid educators stepped out of their normal milieu to help Michelle Gutsch, a Ph.D. student at the University of Minnesota, trawl for data for her dissertation. Gutsch and her advisor Joel Hoffman, biologist with the Mid-Continent Ecology Division of the EPA and adjunct assistant professor at the University of Minnesota Duluth, are investigating how invasive Ruffe might be affecting the ecological niches of Lake Superior’s native fish. Minnesota Sea Grant’s Cindy Hagley sent out the call that brought the educators, some hundreds of miles away, to Duluth, Minn., to join Gutsch, Hoffman, the crew of the Blue Heron, and Sea Grant on one of two research cruises. Hagley said that the highlight of her days on the water was witnessing educators and scientists talking together about science. 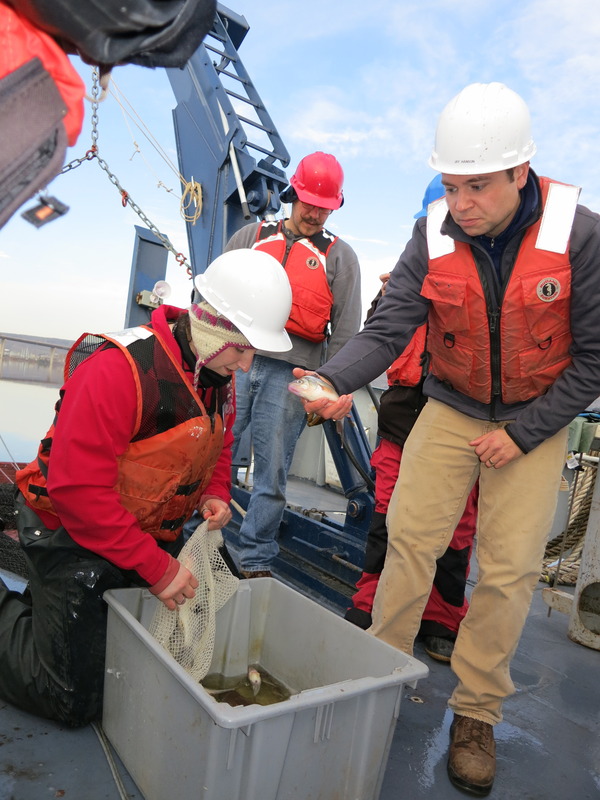 She said, “The educators worked hard all day long doing real research … not just watching.” Cultivating deeper appreciation for research, the scientific method, and real-world science is why Sea Grant offers this sort of professional development for educators. A “Dig-in Day” followed in December to help the participating educators further integrate the shipboard experience into their curriculum. The day was spent working with researchers to process and analyze the fish, invertebrate, and zooplankton samples that they collected, review and interpret water quality data, and explore ways they could share their new knowledge with their students .